Step 1 for turning the sun room into a back porch was to separate the kitchen from the sun room. 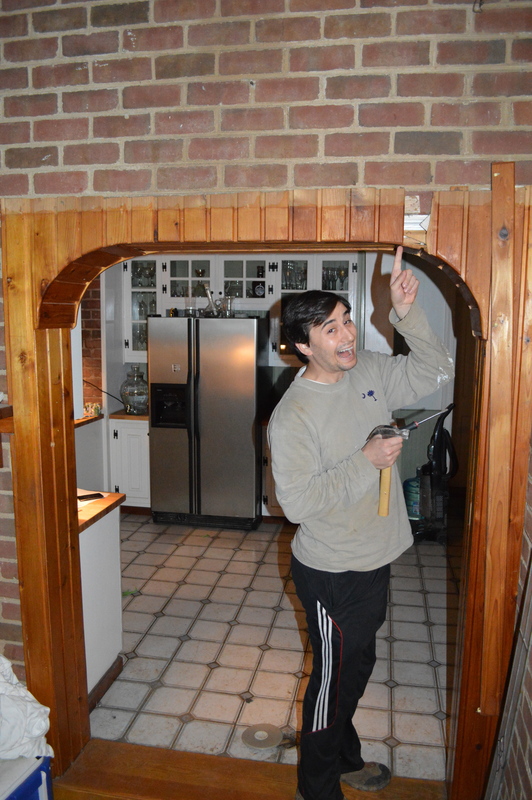 Remember here when we started taking apart the cutesy arch? We kept taking it apart and discovered it was perfectly cut for French doors! We decided to add glass paneled French doors to let lots of sunlight in the kitchen. After a long search at the Habitat Store and normal places like Lowe’s, David and I couldn’t find any doors we liked. We had pretty high criteria: I wanted real wood doors with glass panels– not the plastic stuff separating the glass panels. Anything we found with wood dividers was in the thousands of dollars; everything else looked pretty cheap and not becoming for an 1850 home with wood dividing the window panes. At $495 each, they were pretty expensive but I am hopeful they’ll last a good long while. We ordered them from eBay and they arrived about two weeks later. We hired a contractor to install them for us and they look great! I still need hardware for them but it’s a start!! Previous postBye Bye, Mobility! Next postA Nursery Monogram for the Baby! Last you wrote you are taking the whole room down and leaving a back porch. If that will mean that the trim now surrounding the door is going to be exposed to the weather you have a disaster in the making and you absolutely will regret doing that in the future. You had the right trim for the brickwork under the panelling that came down. It’s there in the second picture. Look at the rest of your windows too. Brick doesn’t have moldings nailed on its exterior. It should be recessed in the opening in the brick. Caulk isn’t going to fix that and if the moulding is glued finger jointed wood, which it may well be in that style, it’s going to be a problem anyway. Looks like tear-out on the bottom of the left piece of moulding. That’s something that any halfway decent carpenter should have been able to avoid too. Lots of warning signs there. Same with the wooden threshold under the door. It will not survive weather and should have been removed or replaced before the doors were hung and before the trim went up (not that it is the right trim anyway). Sorry to be Mr. Negativity and you probably don’t want to hear any of that, but it’s easier to fix now than it will be once it starts to rot and fall apart. You want it looking good not just now, but in a few years too. One final word of caution. 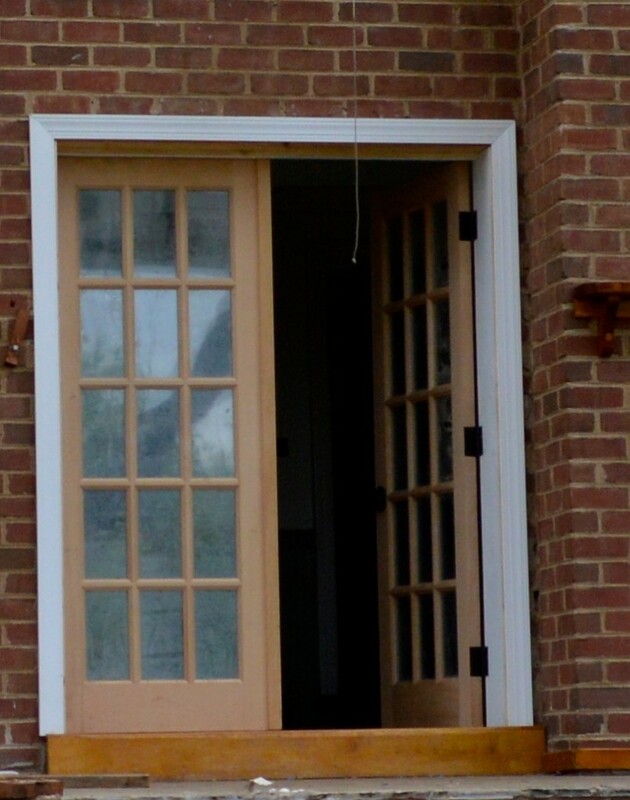 You may be tempted to put a clear finish on those doors, but again if they are going to be exposed to weather that is really not a good idea no matter what your carpenter tells you. UV light destroys cellulose which means after a few years the polyurethane (which is what everyone seems to use) or spar varnish doesn’t have anything solid to adhere to and slight expansion and contraction with the weather makes for small cracks in the finish which let water in which makes for more expansion, which makes for more cracks and staining etc. in a vicious cycle. I could show you numerous examples around town that looked great for about a year and now look just awful. Paint is your friend. Make sure to take the doors down and paint the top and bottom ends of the door well to seal up the end grain of the vertical pieces. For exterior use, the ends of the door trim in the photos should have been painted before installation too. Thank you for this!!! No, I appreciate the tips, and welcome them… please don’t think of yourself as Mr. Negativity at all. I don’t understand what you mean about the brick trim. Unfortunately, we’ve gone forward with a few more steps on the back porch (to be blogged about soon!) and it turns out the carpenter we hired was a complete sham and absolute waste of money. 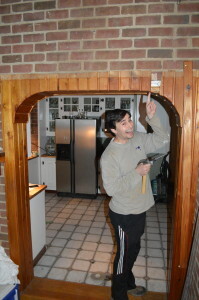 After a long soul-searching debate we’ve decided not to sue him but have had to redo most of his work, so the fact that he didn’t know what he was doing with regard to trimming exterior doors doesn’t surprise me at all. What would you do for the threshold? Replace with something like brick or another kind of wood? And thank you for the tips on polyurethane! Looks like we’ll be taking those doors down asap. We are having a roof put on the back porch so the doors aren’t totally exposed to the elements but they will be to a degree. I was a bit hesitant to pile anymore concerns on top of broken feet and a baby to take care of. That’s quite a combination already, and then there is the rapidly approaching holiday crazy time. I have had to do my share of re-doing work I’ve paid contractors for and I know it’s an awful feeling. I do believe it’s almost always better to deal with stuff as soon as possible when it’s going wrong though. My guess is that the threshold was just done to tie the panelling together and sort of finish off the look the previous owners were aiming for (better to just accept that they had something they were after even though we agree it had to be ripped out). I doubt it does anything at all other than to maybe make the panelling work out more easily. The best explanation of why that might be is the trim that your latest carpenter put up. See how the outer edge on the left is hanging in space with nothing to line up with at the bottom end. The panelling probably created a similar problem in the other direction (into the opening) that the threshold solved in some fashion. So, I’m just guessing from a distance that whatever floor you have on the inside (house) side of the doorway extends right up to the edge of the step. I can just barely see it poking out of the end in your last photo above. 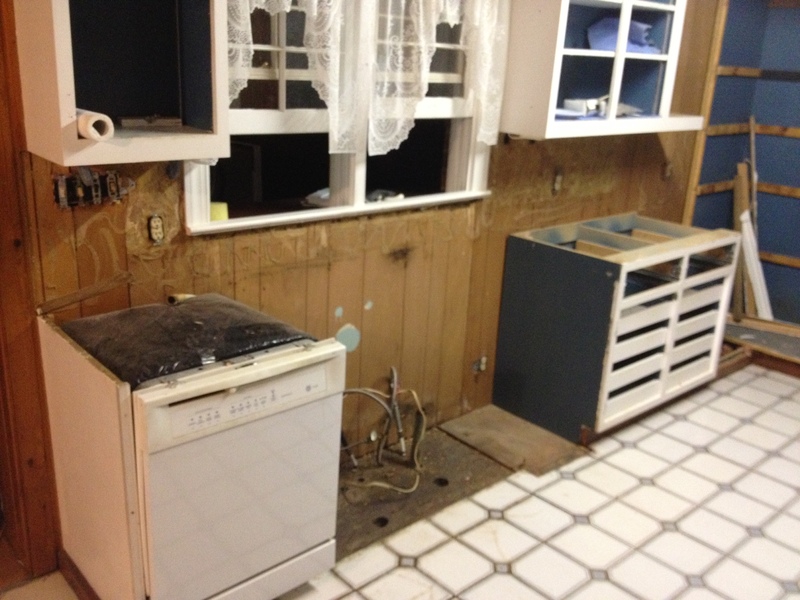 I looked at a few of your kitchen floor tearout photos and can’t make out what is really going on there. I believe that some of your kitchen floor is soapstone. If it is there, then I’d just take out the threshold and lower the door that distance. If it’s concrete below the threshold or your interior floor is something else, then things get a bit more complicated but still solvable. I’d need more info on that then to make a sensible suggestion. The trim thing is kind of hard to explain without a diagram, but here are some basics. Inside trim developed to cover the joint between 2 different materials. Traditionally interior walls in wooden framed houses were plaster. To put plaster up, they framed, covered with lath, put boards up at the floor that were the final plaster thickness and then lined window and door opening with boards that were wide enough to extend that same plaster distance beyond the the lath. Plaster was then applied to the depth that those boards established. 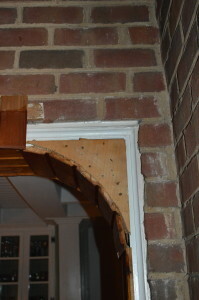 The joint between the plaster and the striking boards was then covered by a strip of moulding. 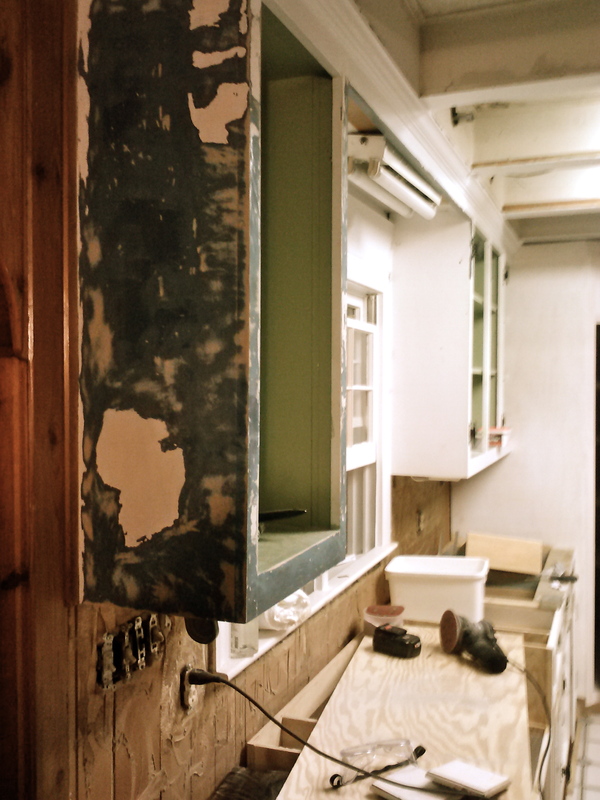 Sheetrock has replaced plaster. Since it goes up in sheets, it doesn’t need the striking boards put up first. 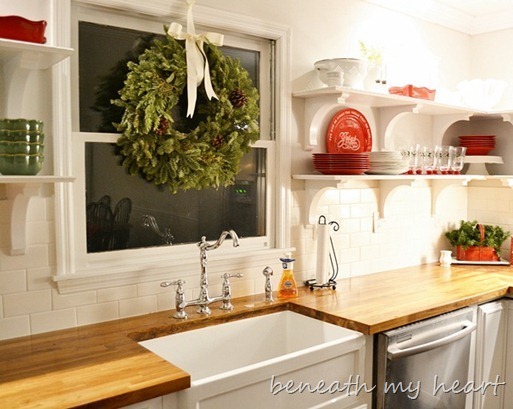 In order to keep a traditional look, the moulding shown above was developed. The flat section with the bead sort of replicates the striking board and the heavier section sort of replicates the backband. In the plaster system, that flat part would be level with the plaster. Since that actual molding fakes that look and gets nailed over sheetrock instead they make it thin. It’s also probably finger jointed white pine. OK, but not great for interior, doesn’t really go with the old style plaster trim, bit often done anyway for cost and simplicity reasons. Not at all an exterior trim ever. For wood sided exteriors, a system similar to interior plaster developed. Framing goes up, window and door opening are lined with flat boards that do not extend past the framing surface. Flat boards are nailed on the exterior surface around the openings and maybe vertically at the house corners. Siding goes up between those boards. Extra moulding may be applied or be a part of the boards that surround the windows. Time, place, and particulars of style affect all of that, but the principle is more or less the same. Brick exteriors are made in a very different way (finally something that seems to apply to you). Your house has a wooden frame that has been covered with brick at some point. That’s obvious since it has no brick ends showing on the walls and no arches above the openings. Masonry structures are built of whatever unit (brick, block, stone) that the builder chooses and then trimmed with wood parts as necessary. 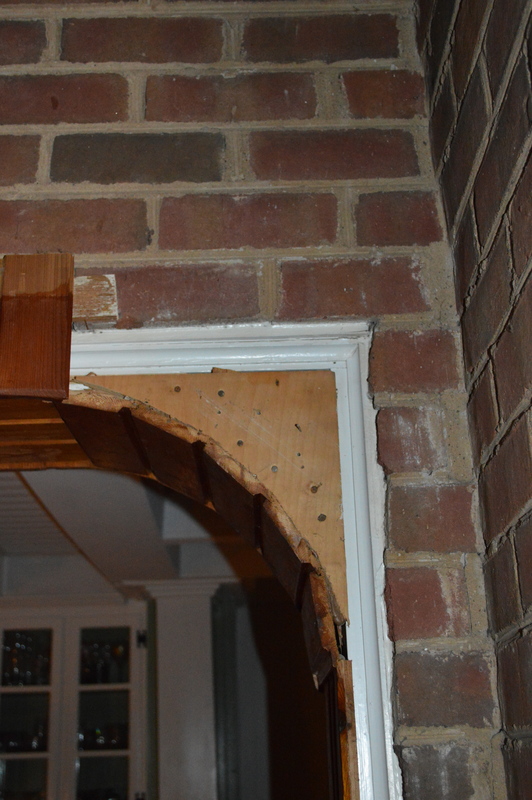 When that is done, an opening is left in the wall and the trim does not lay over the exterior surface since there is no reason for that to have been done to help with building, it would be exposed and catch water, and it would be harder to fit neatly. 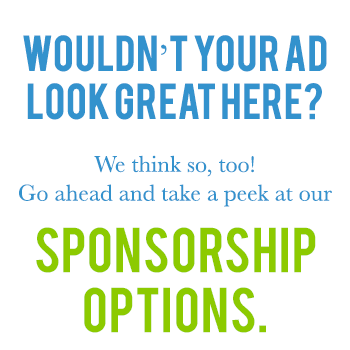 Go outside and take a good look at your windows or look about halfway down the page at this link. http://www.oldhouseweb.com/forums/viewtopic.php?f=2&t=17638 That house is also wood (maybe cinderblock) covered with brick. See no end course. A bit of brick terminology here might help too. http://www.builderbill-diy-help.com/soldier-course.html Look at that window trim too. If you go back and take a look at the old situation you had, second picture above you will see that’s what you had. It may look a bit odd or sloppy , but it was nicely scribed to brick that had been cut and was actually very well done. 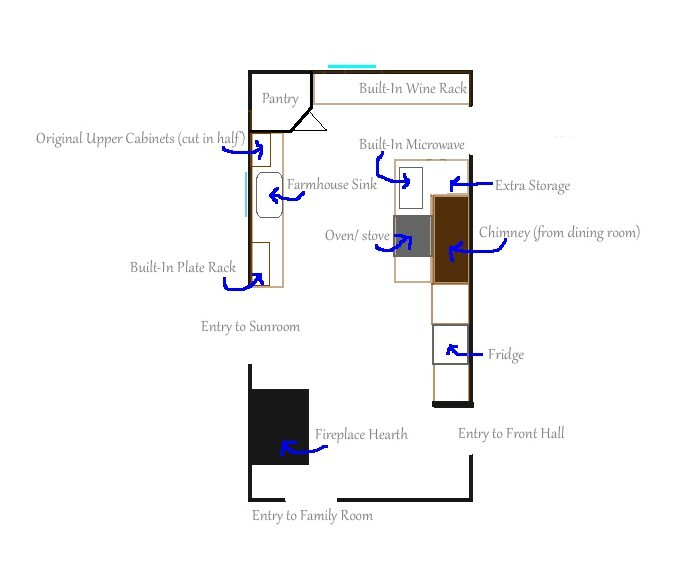 Since you have a hybrid house that I’m guessing was built in at least 3 exterior stages, you will probably have some odd situations to deal with. In a wooden framed house with wooden siding, the boards that line the window and door openings extend plaster thickness into the house but are flush with the exterior of the framing. In a house that is actually constructed of brick, there wouldn’t be any framing, plaster would go on the inside of the brick, not lath (interior walls in old brick houses are often but not always wood) and the trim would be added after the shell is built. So, that’s an epic and seemingly random walk through moulding, but understanding all of that will hopefully hep you understand the particulars of that door. 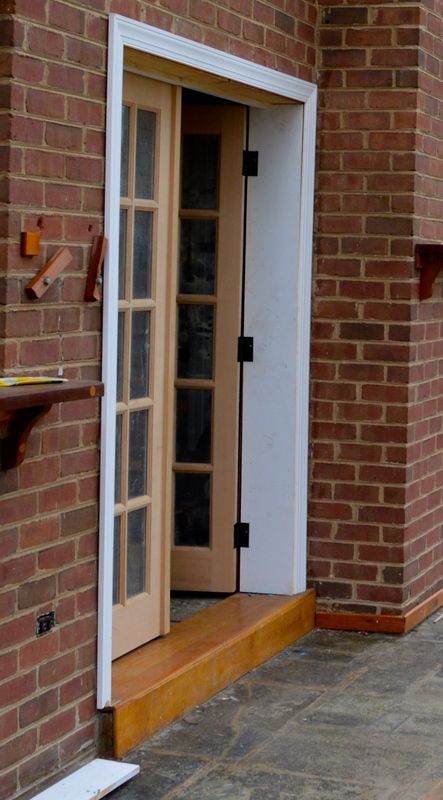 You need a door framing and trim strategy that will work both inside and outside. That will probably take a bit of thinking (much more that you carpenter was capable of) to pull off t this stage. You have nice doors that will work there and you have a lot invested in them so it’s worth the trouble to get right. If you send me an email, I will come take a look and give you some advice. I’m not trying to sell you my services and would not let you hire me to do work for you if you tried since I have way too much of my own to do. I don’t usually give anyone my real email address for fear of spam, but I will change the one I leave this comment with to a real email address. All I ask is that I don’t get added to anyone’s email list.